Welcome to the Quranic Arabic Corpus, an annotated linguistic resource for the Holy Quran. This page shows seven parallel translations in English for the 53rd verse of chapter 33 (sūrat l-aḥzāb). 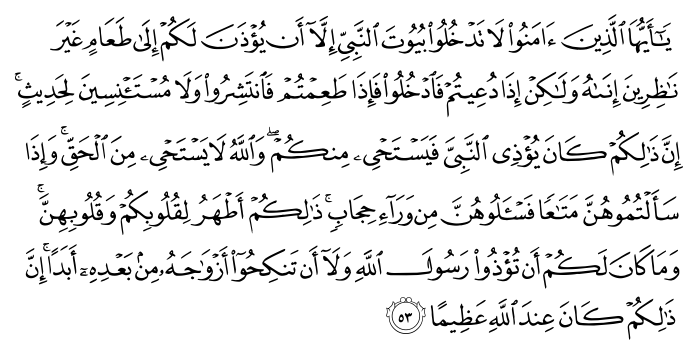 Click on the Arabic text to below to see word by word details of the verse's morphology. Pickthall: O Ye who believe! Enter not the dwellings of the Prophet for a meal without waiting for the proper time, unless permission be granted you. But if ye are invited, enter, and, when your meal is ended, then disperse. Linger not for conversation. Lo! that would cause annoyance to the Prophet, and he would be shy of (asking) you (to go); but Allah is not shy of the truth. And when ye ask of them (the wives of the Prophet) anything, ask it of them from behind a curtain. That is purer for your hearts and for their hearts. And it is not for you to cause annoyance to the messenger of Allah, nor that ye should ever marry his wives after him. Lo! that in Allah's sight would be an enormity. Yusuf Ali: O ye who believe! Enter not the Prophet's houses,- until leave is given you,- for a meal, (and then) not (so early as) to wait for its preparation: but when ye are invited, enter; and when ye have taken your meal, disperse, without seeking familiar talk. Such (behaviour) annoys the Prophet: he is ashamed to dismiss you, but Allah is not ashamed (to tell you) the truth. And when ye ask (his ladies) for anything ye want, ask them from before a screen: that makes for greater purity for your hearts and for theirs. Nor is it right for you that ye should annoy Allah's Messenger, or that ye should marry his widows after him at any time. Truly such a thing is in Allah's sight an enormity. Shakir: O you who believe! do not enter the houses of the Prophet unless permission is given to you for a meal, not waiting for its cooking being finished-- but when you are invited, enter, and when you have taken the food, then disperse-- not seeking to listen to talk; surely this gives the Prophet trouble, but he forbears from you, and Allah does not forbear from the truth And when you ask of them any goods, ask of them from behind a curtain; this is purer for your hearts and (for) their hearts; and it does not behove you that you should give trouble to the Messenger of Allah, nor that you should marry his wives after him ever; surely this is grievous in the sight of Allah. Muhammad Sarwar: Believers, do not enter the houses of the Prophet for a meal without permission. if you are invited, you may enter, but be punctual (so that you will not be waiting while the meal is being prepared). When you have finished eating, leave his home. Do not sit around chatting among yourselves. This will annoy the Prophet but he will feel embarrassed to tell you. God does not feel embarrassed to tell you the truth. When you want to ask something from the wives of the Prophet, ask them from behind the curtain. This would be more proper for you and for them. You are not supposed to trouble the Prophet or to ever marry his wives after his death, for this would be a grave offense in the sight of God. Mohsin Khan: O you who believe! Enter not the Prophet's houses, except when leave is given to you for a meal, (and then) not (so early as) to wait for its preparation. But when you are invited, enter, and when you have taken your meal, disperse, without sitting for a talk. Verily, such (behaviour) annoys the Prophet, and he is shy of (asking) you (to go), but Allah is not shy of (telling you) the truth. And when you ask (his wives) for anything you want, ask them from behind a screen, that is purer for your hearts and for their hearts. And it is not (right) for you that you should annoy Allah's Messenger, nor that you should ever marry his wives after him (his death). Verily! With Allah that shall be an enormity. Arberry: O believers, enter not the houses of the Prophet, except leave is given you for a meal, without watching for its hour. But when you are invited, then enter; and when you have had the meal, disperse, neither lingering for idle talk; that is hurtful to the Prophet, and he is ashamed before you; but God is not ashamed before the truth. And when you ask his wives for any object, ask them from behind a curtain; that is cleaner for your hearts and theirs. It is not for you to hurt God's Messenger, neither to marry his wives after him, ever; surely that would be, in God's sight, a monstrous thing.